Can we develop a way to increase the number of matches made from a pool of adopters and children? Last week the ASGLB published data on adoption covering the period 1 April to 30 September 2018 . It is the first time in several years that the ASGLB has published the latest available data before the next round of data collection is completed, and is the closest we can currently get to ‘real time’ data, so I’m really pleased that the CVAA have been able to do this. The story the data tells is mixed – there are some positive signs but still some significant concerns. The number of adoption plans approved (ADM decisions) continued to fall, and this has helped reduce the immediate pressure on the adoption system. However I worry that it may just be displacing pressure to other parts of the wider children’s social care system. The data published now includes figures for change of plan, but only for the period covered. CVAA have agreed to pull together historical data for me so that it is possible to see if there has been any significant change over time. The number of applications accepted from prospective adopters increased slightly for a while but most recently fell back again. 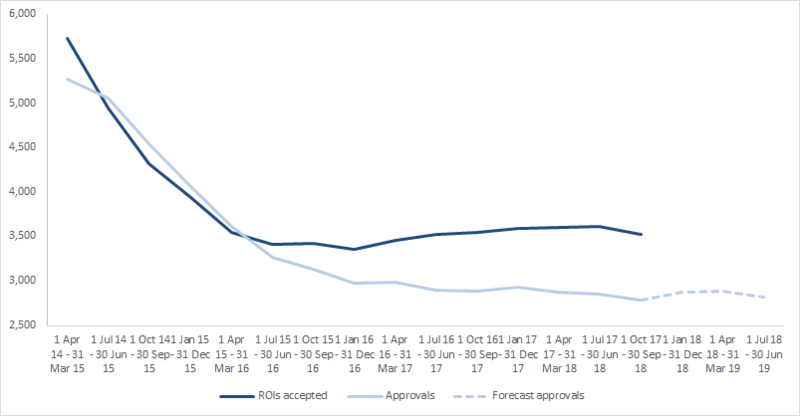 However, the number of households approved to be adopters has continued to fall slowly and steadily – though as you can see from the dotted line on the chart below I’m predicting that the number of approvals will level off. 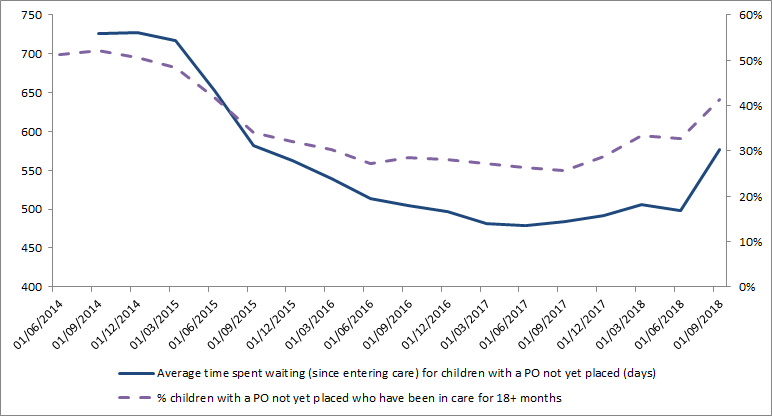 Children not yet placed at the end of September 2018 were waiting longer. While I expected this, there was a surprising jump at the end of the most recent quarter that has meant that the waiting time frame is back to the same level as three years previously. The data also shows that a higher proportion of children are waiting for longer, so the progress made since 2012 is rapidly being undone. Finally, the adopter insufficiency is now clearly evident, driven mainly by the fact that the number of children with a PO waiting to be placed reached a high of 2,900 children at the end of June 2018 (the highest number since December 2014), falling back to 2,730 children at the end of September 2018. However, I currently forecast that the gap will close again by March 2019 assuming the fall in the number of adoption plans continues. 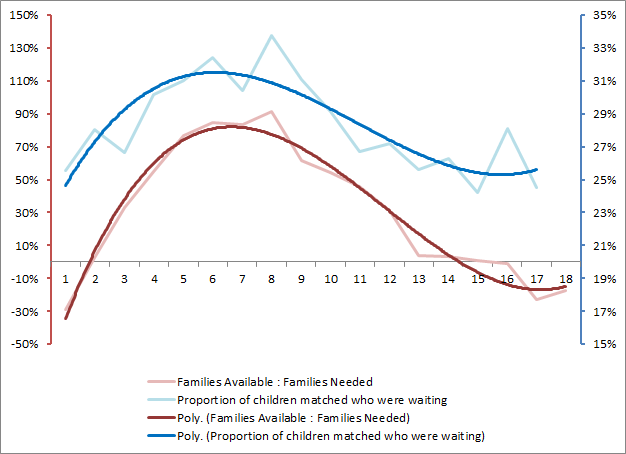 In my last blog I shared with you a new insight I had discovered that showed a clear correlation between the number of children matched and the availability of adopters. This generated some interesting exchanges with people in the sector, which has led me to believe I’m on to something! One point that was raised is that the nature of the correlation can change over time and this is evident when I include the latest data. As you can see the gap is widening between the two lines. This indicates that more matches are being made in proportion to the number of adopters available and so the sector is being more ‘efficient’ in matching – i.e. matching more children with fewer adopters. This could be due to there being a higher proportion of adopters available who are suitable for the children waiting, perhaps as a result of more targeted recruitment; or that, due to the shortage of adopters or improved matching practice, social workers are now considering matches that they previously would have wrongly discounted. 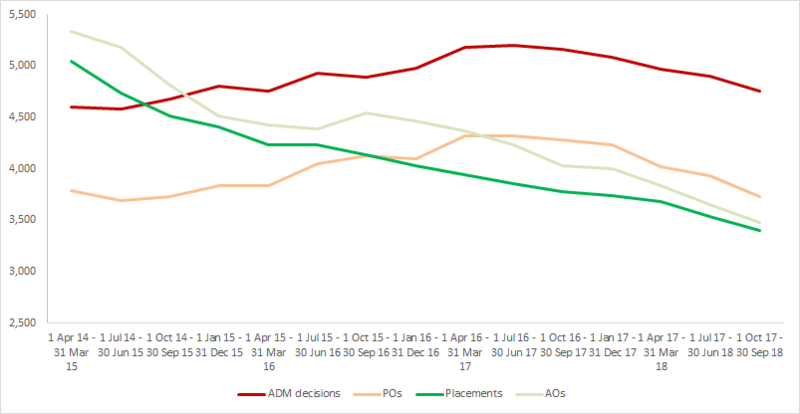 I use the word ‘wrongly’ based on the assumption that if a match is approved then it is highly likely to be suitable, as the quality assurance built into the system (panel, ADM) is unchanged – to validate this we would need to track the rate of pre-AO placement breakdowns. We can use the widening and narrowing of the gap in the chart above as a measure of matching effectiveness. This could be used as part of the evaluation of RAAs and in testing my Collective Matching concept. 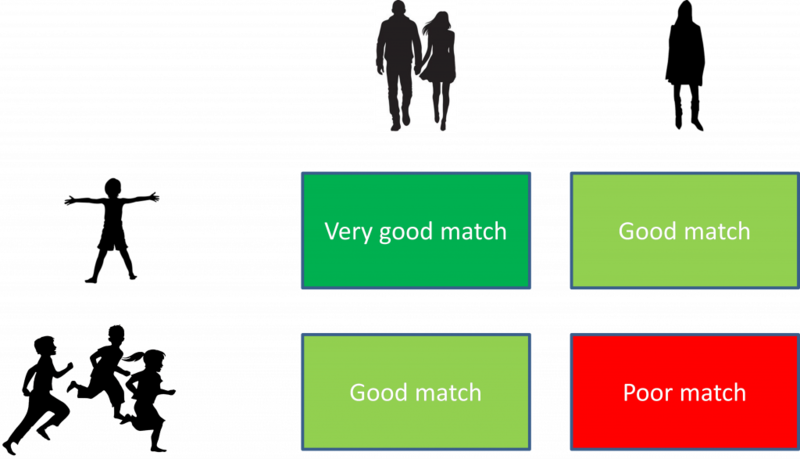 The image below shows two sets of adopters and two sets of children and the perceived ‘strength’ of the matches between them. Under current practice, the likelihood is that the ‘very good’ match would be pursued, leading to only one match being made. Taking a Collective Matching approach, we would progress the two ‘good matches’ so that two matches are made. I have seen social workers take this approach but it has been in isolation rather than systematically. My aim is to scale this up so that it is applied to all children who need to be matched. Practitioners would consider the suitability of the matches proposed and decide whether to follow up the potential match or not. The steps taken to follow up a match would be the same as the current practice; where a proposed match was turned down, the child/ren and adopter/s in question would be returned to the pool for inclusion in the next round of ‘collective matching’. Each round occurs as frequently as is appropriate: it would depend on the speed with which practitioners review proposed matches and the rate at which new children and adopters are added to the pool. We don’t want to add unnecessary delay for children. I’m currently piloting Collective Matching with three RAAs. One aspect that has attracted them is that the approach is objective and comprehensive – all matches are considered, not just ones that a social worker is aware of, and decisions are made on what is best for all the children that the agency is responsible for. With multiple LAs’ interests at play, it will be important that RAAs can evidence that they are servicing all LAs equally to help maintain a strong regional partnership. If you would like to find out more about Collective Matching or get support with analysing your data, contact kevin.yong@coram.org.uk. Adoption in England – can we predict the state of the system? Adoption in England – a system under pressure? To find out more about what we offer to our members and how to become a member please visit the Join Coram-i page.